Helen Mitchell is a retired Registered Nurse, BN. Helen spent thirty (30) years most of which were in Long Term Care. As a certified Foot Care Nurse operating her own business Helen’s career was very busy and fulfilling. Helen has a true passion for Healthcare. 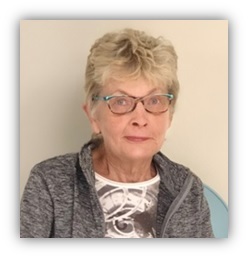 Serving as the Secretary of the Golden Links Lodge Board of Directors allows Helen to play an integral role within our Long Term Care facility. Helen is married and a mother of two (2) daughters and three (3) grandchildren! Family is first for this lady! She loves walking, yoga, reading and crafts. Volunteering is part of who Helen is. She was the Chair of the Oddfellows and Rebekah Arthritis Committee. For fifteen (15) years she has belonged to the Rebekah Lodge for forty (40) years. In those years she has held many offices within her Lodge. She also taught Sunday school for fifteen (15) years. In addition to all of this, she served on the Board of Grace Hospital/Golden West Lodge for six (6) years. Helen’s years of experience and wealth of knowledge in Long Term Care will surely benefit Golden Links Lodge. We are incredibly thankful for her time and commitment.